REVISED NOV 2017Streetwise Barcelona Map is a laminated city center map of Barcelona, Spain. The accordion-fold pocket size travel map coverage includes: Main Barcelona Map 1:12,000 Old City Center Map 1:6,000 Barcelona Area / Metro Map 1:73,000.Dimensions: 4" x 8.5" folded, 8.5" x 36" unfolded Explore the Barri Gòtic. See Gaudi's masterpieces Sagrada Familia and Parc Güell. REVISED 2018 Streetwise Brooklyn Map is a laminated city center map of Brooklyn, New York. The accordion-fold pocket size travel map has integrated subway station locations. A complete index of streets, points of interest, education, culture, transportation and parks is clearly listed. 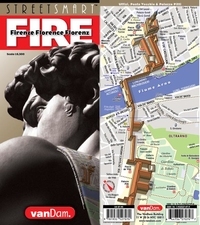 Florence UNFOLDS maps all top attractions, hotels, churches, museums, piazzas, transit systems, and more - all at an immensely legible super-scale complete with 3D building illustrations. Each map unfolds to 12 times times its original size, then refolds automatically when the covers are closed. Rome StreetSmart maps all top attractions, churches, hotels, major architecture, monuments, and shopping - all at an immensely legible super-scale of 1:12,500, complete with 3-D building illustrations. Clear information design allows users to read the map from three feet away and has earned VanDam maps a place in the MoMA Collection. San Francisco StreetSmart maps all top attractions, beaches, hotels, major architecture, and shopping - all at an immensely legible super-scale of 1:32,000, complete with 3-D building illustrations. Clear information design allows users to read the map from three feet away and has earned VanDam maps a place in the MoMA Collection. VanDam's award winning Paris StreetSmart maps all top attractions including monuments, hotels, major architecture, and shopping - all at an immensely legible super-scale of 1:12,500, complete with 3-D building illustrations. Clear information design allows users to read the map from three feet away and has earned VanDam maps a place in the MoMA Collection. Florence StreetSmart maps all top attractions including museums, major architecture, historic sites, hotels, and churches - all at an immensely legible super-scale of 1:6,500, complete with 3-D building illustrations. Clear information design allows users to read the map from three feet away and has earned VanDam maps a place in the MoMA Collection. VanDam's award-winning London StreetSmart maps all top attractions including major architecture, hotels, parks, theatres, and shopping - all at an immensely legible super-scale of 1:14,000, complete with 3-D building illustrations. Clear information design allows users to read the map from three feet away and has earned VanDam maps a place in the MoMA Collection. With the release of StreetSmart Beijing just in time for the 2008 Summer Olympics, New Yorks award-winning mapmaker Stephan Van Dam has achieved both a personal best and a great leap forward in information design of the Chinese capital. VanDam's newest Cuba StreetSmart maps all of Cuba's cultural and natural riches at an immensely legible scale. It is both a relief country road map and culture map. The map features attractions, beaches, hotels, resorts, the latest restaurants, bars and supper clubs all expertly researched and clearly marked.